We started this the week before spring break. I think students had three days in class to work on it, and then it was due after spring break (many just had some gluing to do). I provided the posterboard and colored paper. They provided the rest. * I am particularly proud of the project that ___ and I worked on together. We worked really hard on it and stayed after school and although it was sort of confusing at first, once we got the hang of it I began to really understand optimization… I generally prefer projects because it allows me to be more creative and think more deeply than tests so I actually did enjoy the can project. I thought that that having to do the same thing for five cans got a bit repetitive so maybe if you were to do it again have the students do some different kinds of shapes or types of problems. * The can project I was really proud of. ___ and I worked for hours and it and I think the end result was really good. Our poster was well made and looked good… I really liked the can project. I think we could have gone over the project more before starting because the goals were a little unclear. * This may seem insignificant, but one of the most memorable things [from the quarter] for me was the way that this mountain of math for the cans project simplified into this beautiful little thing (h=2r) after doing all this calculus. It was quite cool when I saw that… [As for making changes for the project next year] Honestly, I’d ditch the poster element. It added nothing to my understanding, and ended up being more of a burden than anything… The calculus was certainly worth-while, but that was only like a quarter of the work. The rest was repeatedly plugging the numbers into a program I made (I tried writing a python script for the first time) and writing them down. So basically, make us do more complicated (and more in general) calculus warter than a wee-bit of calculus and a lot of “filler” kinda stuff. * I did like the can project, but I was sometimes confused about the exact requirements. It was also difficult to finish everything in class, but it worked out when we had the extention until the Monday we got back [from Spring Break]. * The most memorable event from this quarter must have been the “Can Can” project. It gave the class and I time to apply our calculus knowledge to real world concepts… I thoroughly enjoyed the can project because I felt like I understood it entirely from day 1. The amount of work when done between a pair was not tedious at all as well. * As for the can project, I did enjoy working on it but found it to be a bit repetitive and tedious. I also think had we more time to complete it I would have had more fun with it. I did feel I understood exactly what we were doing. I think if you were to do it next year you should allow more time so students can be more creative with their project. * The can project was definitely worthwhile. The only thing I disliked about the project was that we used the same shape every time. I think we could have optimized different objects to make it more interesting, just because the process became kind of repetitive. I think you should still do it next year if you would like but you could choose to alter it a little bit. * I really liked the can project. 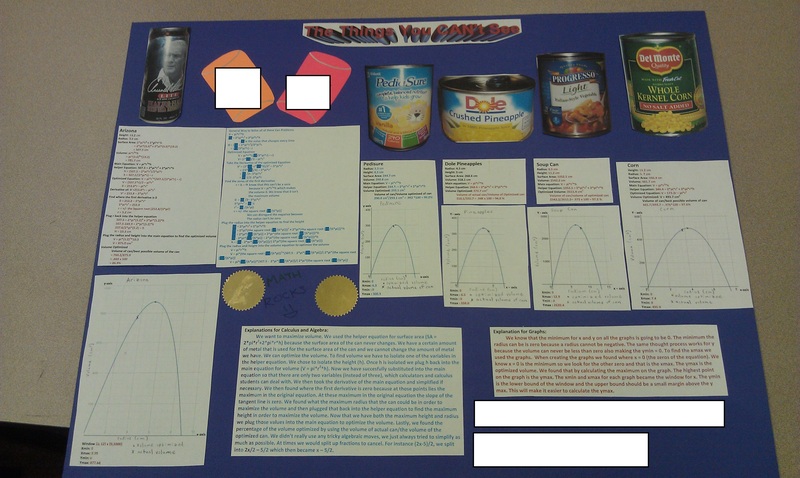 For me, the can project was able to show directly the connection between what we were learning in Calculus and the real world which is something that really interests me. I felt like I understood what was being asked of us, and I think that it would be a good addition to next year’s Calculus curriculum as well. * In general, optimization was my favorite/most memorable part of the quarter. It’s probably the only math I’ve ever done that requires logical, real world thinking at every step (for example, who cares about the optimization of the graph when it’s less than x=0, because you can’t have negative distance). In the past, I’ve felt that a lot of math does correlate closely to things in the real world, but this is the first time where it’s so clear how everything relates. That said, I felt like the can project went extremely well, considering this is the first time it was done in this class. I felt like I totally understood everything that was going on, and I enjoyed taking measurements, doing calculations, and seeing how much the lima bean companies were ripping us off (hint: they’re not! It’s the tuna companies that are evil). The only change I would suggest is allowing one or two days more of time to finish it. Although we got all our measurements and calculations done, the most difficult and lengthiest part of the project proved to be printing everything out, cutting it, and creating the poster. * Volume optimization, more than any other topic, really stood out for me this quarter. When we first started doing it, I was confused and didn’t entirely understand what to do. I think I was a bit taken aback by translating words/pictures into mathematical equations, but once I worked at it and practiced a bunch I became better at making that translation. I thought that the can project was very interesting, and it helped me make the translation better, as well as illuminating an important real-world connection. I was interested to see which companies used their material properly! I did feel, though, that 5 cans was more than was needed — it was basically the same thing every time, so fewer cans could have been enough to still get the point across. * I really actually liked the can project and got pretty into it. I liked it because it felt like we were working independently on applying what we learn in class to the real world. I think it should be done again next year. * I liked the can project a lot. It was cool figuring out how much volume a can could hold if we changed the dimensions of it. At first I did not understand what to do after I found the things I needed to know (height, radius, etc.) — if there was a group where both partners did not know how to figure out the equations needed, then the project would be difficult for them. Maybe having a quick intro/hint class discussing the project will help. I think you should do it again. * I thought that the can project was very effective because it took what we were learning and applied it to real life. I thought it was very good in allowing us to see how optimization works in reality. I definitely think it should be done again in alter years. * Even thought I like the idea of the project, my experience with it was not a good one. It certainly illustrates the idea of optimization very well and it’s always nice to see a practical application of things we learn. But due to the circumstances of my partnership with […] it felt very tedious. I don’t think there is much you could do to change it if you are going to keep it, so I would recommend devoting more class time to this project. * I liked the can project, however it was a little hard to do while also focusing on the problem set. It was also hard to focus on both of those in the week leading up to spring break, so if possible I would recommend splitting them up and doing at least one of them in weeks other than the one before the break. I did enjoy the project, though with the problems above I probably did not enjoy it as much as I could have. I would say to do it again next year because (as math classes don’t always directly relate to the real world) it was cool to apply what we have learned to something we may experience once we leave school. * I actually really enjoyed the can project. It was a nice break from regular busy work and I definitely got a good handle on the concept it was trying to teach. I would highly recommend doing it again next year. 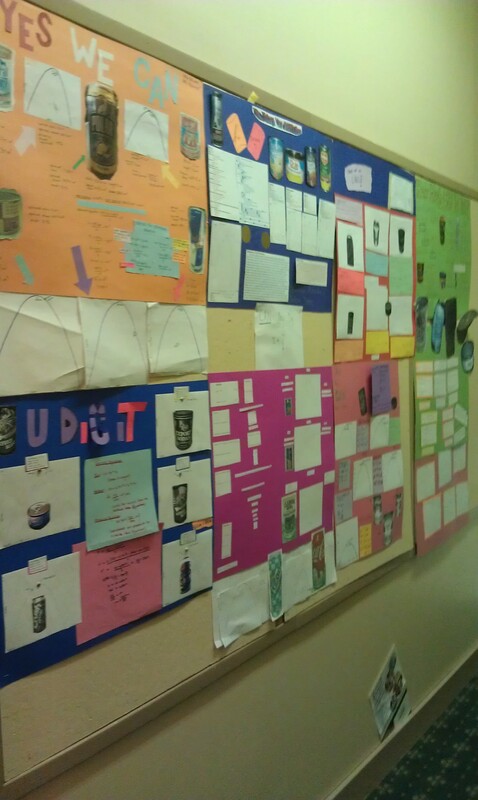 * I enjoyed the Can Project, making our poster, and working with my group members to find the optimized volumes. I definitely think you should do it again next year. * I though the can project was good. I liked working with people to create something fun and pretty, and I liked the splitting up of labor rather than doing it on our own. I would say next year maybe give people a bit more time for the project — I felt very rushed doing it. Of course we ended up finishing, but kind of just barely, and so maybe a big more time would help. * The most memorable thing from this quarter is the can project. In the beginning, I had difficulty understanding optimization but after doing the project it made a lot more sense. Applying the concepts to real life made them much more understandable. At first I had difficulty understanding the purpose of this project, however it proved to be beneficial to me. I got a lot of good feedback from the students, and I am glad that they are comfortable enough to share their thoughts as frankly as they did. Overall I think this thing, which I whipped up in a couple hours the day or two before I decided to do it, worked out as a good thing to do before spring break. It was low key, kids were working independently (with their partners), it allowed for some mindless work and some very mindful work, and kids seemed to learn from each other. I also got the sense from their responses that they really had their understanding of what is truly going on with optimization problems solidify. I clearly have two big changes to make next year. First, I need to give more time. I think the three class days that they had was appropriate to get the math done and the poster started, but I think that after this class time, I should give students a week to work on it at their leisure outside of class, while we forged forward with the material. That seemed to be one of the biggest problems — me thinking students could do everything in three days. Second, I think I need to give a bit more choice and make things a bit more scaffolded. For some, doing 5 cans was tedious. For others, it felt appropriate. Ways to do this would be to require 3 cans, and then some options of other things to take their knowledge further. One question (which I almost did) I could ask them is to measure the volume of a can, and ask them if they could create a can with the same volume but smaller surface area (so it would be cheaper to produce). Or, as a student suggested, I could assign them different shapes and ask them to volume optimize it (boxes, spheres, cones, etc.). This is a fun topic and it looks like the kids really got into it. One structure I’ve been using lately is, first all the students do some sort of ‘core’ project (like your 3 cans), and then they choose an extension. The extension could be new shapes, optimization outside of the grocery store, videos or creative parts, etc. You could also fix the volume, and have them optimize for surface area. I did a project on this last year, and I was surprised at some of the results — particularly with the hexagonal prism! Fun stuff.